Different types of keyboards are made in different time for many purposes. In 19th-century teleprinter devices use a very simple keyboard. Latter keyboard develops day by day. In this post, I am trying to present different types of computer keyboards of all time. So let's start. Today a normal keyboard has around 105 to 110 keys. Generally, we use a QWERTY keyboard but there is some other type of keyboards also available in the market. If you separate keyboards according to there layout there are four types of keyboards available QWERTY, AZERTY, QWERTZ, and HCESAR. HCESAR keyboards were widely used before 1970. Slowly it replaced by AZERTY layout. In the 1980s, when the Portuguese government started replacing old typewriters and computers a new keyboard layout was developed QWERTY. Now almost every computer use QWERTY keyboard layout. As indicated by its connectivity there is 6 types of QWERTY keyboards available in the market. ADB, XT, PS/2, mini PS/2, USB, and Bluetooth or wireless keyboard. ADB keyboard was developed by Apple for its own computers. You may found this port in early apple devices. XT keyboard was mainly used in IBM computers. It is very similar to a standard RS-232 plug. This type of port and keyboard is very rare now. AT keyboard was widely used in personal computers till 2005. After the development of PS/2 port this type of keyboard being obsolete. If you have any old P3 or P4 desktop in your garage, go and check. PS/2 and mini PS/2 are the same port type use in most of the modern desktop. As PS/2 port has lower latency than other types of ports I recommend this keyboard to practice typing. Read this article to choose your keyboard "The best keyboard ever made". And use our typing speed test engine to practice typing. USB is the latest technology to connect any keyboard. Nowadays almost every system has a USB or mini USB port. 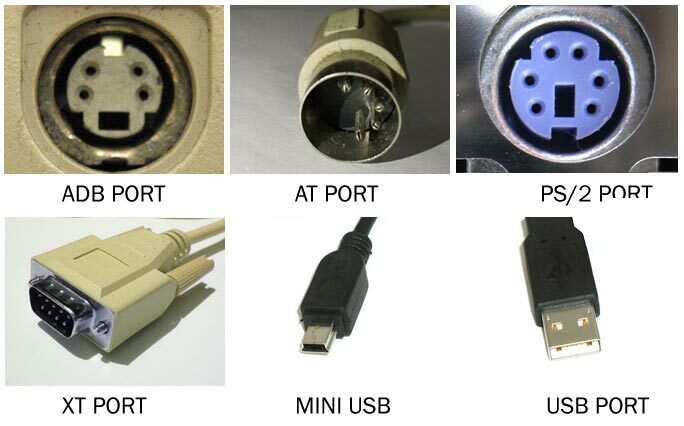 Actually, USB is not a port it is a BUS, that's mean there may have more than 1 USB in a single device. Almost all modern wireless keyboard use USB port to connect with the device. Virtual keyboards are also used USB to connect. These are the most commonly used keyboard type, there are many other types of keyboards also have which use for many purposes. Here I am trying to enlist all the most commonly used keyboard, if you find I missed anything please let me know in the comment section.